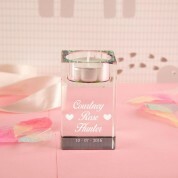 If you know a baby that is approaching her Christening day, then what better gift to give than a commemorative glass candle holder? It comes complete with her name and date. 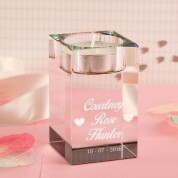 Two love hearts complete the design with a feminine touch. This is a keepsake she can treasure for years to come. 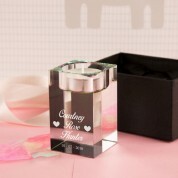 She will love to see it when it is lit, with the reflective rainbow tinted glass. It will suit any decor and will add a touch of class to any room.